Sebastian Vettel was fastest on the first day of testing at Barcelona. The German was a tenth quicker than Nico Rosberg in the Mercedes on a day that proved to be very productive for all teams participating. 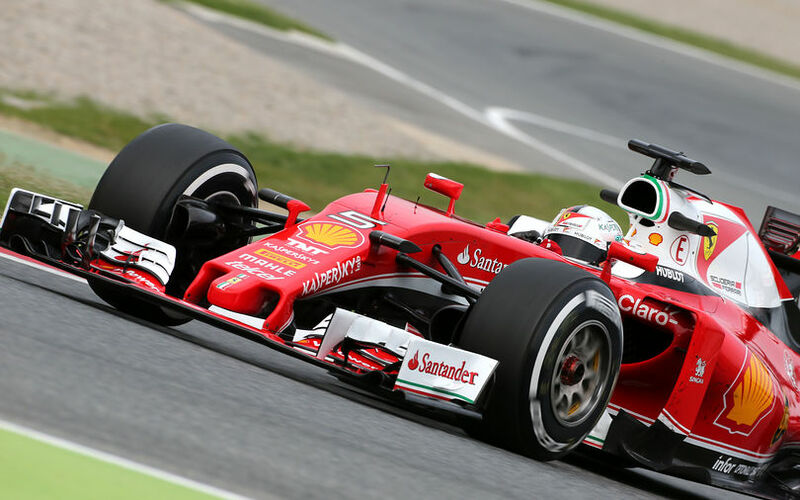 Vettel set the fastest time of the day in 1.23.220, running the Soft tyres. The Scuderia Ferrari driver worked on a programme that included trying various set-up combinations with different fuel loads and tyre compounds. His programme today focused on suspension and setup work using the medium compound tyre, in addition to powertrain analysis. While most teams tried out components and settings for development of their cars into the second half of the season, McLaren Honda however chose to focus on the current moment. Jenson Button completed the morning running the McLaren MP4-31 with aero rakes fitted to the car, enabling the team to validate the upgrades that it brought to last weekend's Spanish Grand Prix. Longer runs were the main theme in the afternoon, while Honda worked out optimised power unit settings for the upcoming Monaco Grand Prix. Daniel Ricciardo at Red Bull ran numerous different set-ups and aero rakes to confirm wind tunnel correlation whereas Williams ran a currently illegal wing to find out the effect of extra downforce, particularly in the twisty final sector of Circuit de Catalunya-Barcelona.